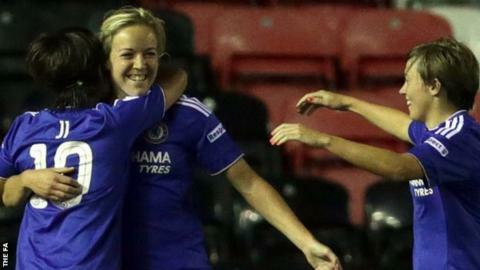 Chelsea Ladies winger Gemma Davison says they are relaxed and focusing on themselves, with the club one win away from lifting a first league title. The Women's Super League One leaders won 4-0 at Liverpool on Sunday to remain two points clear at the top ahead of the final weekend of matches. "We were deadly. We performed all over the team," Davison, 28, told BBC Sport. "I'm really proud of the girls because we dealt with what everyone said was pressure, and it's nothing." Chelsea host fourth-placed Sunderland on Sunday, and will win the title with a draw if Manchester City fail to beat Notts County by more than a two-goal margin. "We've got world class players in our team and I've got faith in every single one of them," Davison added. "As long as we stay focused, we're relaxed and we stick to the game plan, we'll go into the Sunderland game confident, but focused as well because we know they'll be a challenge." Chelsea defender Claire Rafferty highlighted the importance of now having a superior goal difference to second-placed Man City. The left-back was part of the Chelsea side who lost out to Liverpool on goal difference on the final day of last season's title race. "It's nice to get the goal difference back as well, just in case it comes down to that, like last season," Rafferty, 26, added. "We all know how painful it was to go to the last game of the season and lose it on goal difference. "We all said we never want to feel that pain again."